In 1895 the first of the Majestic class battleships came into service. This started a naval revolution as startling as the one that followed the launching of the DREADNOUGHT. For the first time 4 new sets of designs were put together in one ship making them what is now known as a PREDREADNOUGHT. The four new technologies were high velocity main weapons, quick firing 6" mid calibre guns. face hardened armour, and telescopic gunsights. The MAJESTICS were the first capital ships whose main weapons were effective in rough seas due to their high freeboard and good sea keeping qualities. The visual impact of these ships at that time cannot be imagined, but they must have been the same as the "star wars" weapons of today, and they made the British fleet supreme the world over. One of the most complicated and detailed model in the Deans fleet, and truly the PRIDE OF THE FLEET. Some of the major features of this model are the one piece fibreglass hull with all plating detail and armour belt, plus all casemates, hatches portholes, anchor bedplates, and the massive ram bow all moulded into the hull; one piece fibreglass moulded superstructure with deck planking and gun port detail engraved into the moulding. Full size plan in 2 parts with photo exploded instruction book to ease assembly of this massive model. A large sheet of brass etchings with over 300 items, adds the final super-detail to the majestic model. 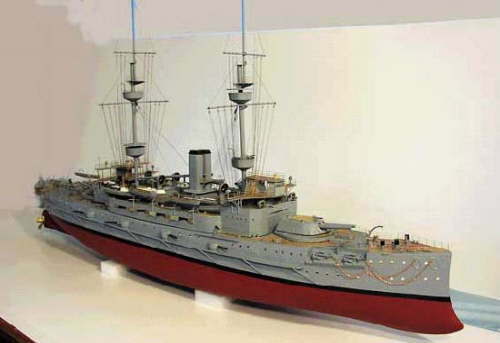 Over 400 cast metal fittings & 100 plus cast plastic items add the detail to this model, decks from marine ply, and 62 vacformings for boats, turrets etc.